One of the most exciting things as a bird watcher is the rare bird. Depending on the location, time of year and degree of rarity, it can create a flutter (pun fully intended) of great proportion, such as when a flock of grackles take off from their roost. We know that rare birds create this excitement, but they also provide a sizeable economic boost; a United States Fish and Wildlife Service report estimates that each rare bird species is worth at least $100,000 to a community. So what exactly is a rarity, how do we find one, and how does the word get out so quickly? 1. Away from their normal range. 2. At the wrong time of year. 3. Have very limited populations. The American Birding Association (ABA) even has checklist codes assigned to birds, ranked 1 to 6, with 1 being the most abundant North American species (e.g. White-winged Dove) and 6 being those that are probably or actually extinct (e.g. Passenger Pigeon). The Green-breasted Mango found on Dec. 4 at Quinta Mazatlan World Birding Center is a Code 4; not recorded annually in the ABA checklist area. I experienced that sensation with the mango, immediately recognizing that it was larger than our typical Buff-bellied Hummingbirds, and had a much heavier, decurved bill. After knowing it was different, my experience with mangos in Mexico kicked in and I recognized the plumage pattern as that of a juvenile or immature bird. The next step involves getting the word out to other birders. Thanks to social media, smart phones, and our general state of constant connectivity, getting the word out isn’t difficult. Bird photos documenting the find are posted to various social media pages, messenger apps, e-mail list servers, and rare bird alert blogs. This is all in addition to birders in the community calling or texting friends. For many rarities, the alerts start going out within minutes, with the goal of giving birders the best shot at seeing the bird. Rare birds have the same requirements as our resident birds; food, water, and cover. The Green-breasted Mango has been regularly seen perching on and foraging around a large Sugar Hackberry; the native tree providing for many insects, and the mango eating those insects (yes, many hummingbirds eat insects). Just as migrating songbirds are attracted to woodlands and forests as stopover sites to rest and refuel, so too will rarities locate areas that harbor the habitat they need. Sometimes, those habitats can simply be your yard; the last Green-breasted Mango reported in Hidalgo County spent several months around a McAllen resident’s backyard! 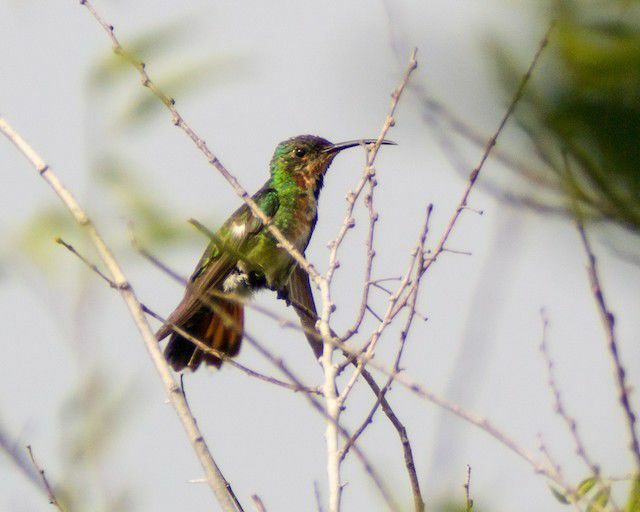 The geographical location of the Lower Rio Grande Valley is a major reason for why we have such an incredible diversity of birds, including the tropical rarities that cause such a stir. Our forests, the Rio Grande, resacas, thorn-scrub, coastal prairie, and even our own backyards are integral parts of providing habitat for our birds. It is a great responsibility to steward our habitat so that future generations can find more mangos and enjoy the Great Kiskadees, Green Jays, Altamira Orioles, and many other birds that live in and migrate through the Lower Rio Grande Valley. For more information, visit www.quintamazatlan.com and join our Saturday morning Songbird Strolls. John Brush is an urban ecologist at Quinta Mazatlan in McAllen.